Ready? We're set, Let's go! When you need a reliable transportation provider; Bayes Coachlines is a great choice. Our large fleet of modern coaches, tour buses and city buses are available for nationwide tours, bus charters, coach hire, day trips, school runs and event transportation. Experience the Best of New Zealand! New Zealand is one of the world's most beautiful countries and we take great pride in introducing it to our visitors. 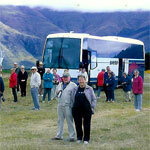 For nearly 40 years we have been operating coach tours & bus charters throughout New Zealand. We have extensive 'local knowledge' that can ensure your tour is a great success. Talk to us to find out how! Bayes is a family run business, with friendly helpful drivers, who have many years of experience. We love what we do and it's that approach that really makes us different. We're eager to make your New Zealand travel experience enjoyable and hassle free! Click here to find out more. Our modern fleet of quality charter coaches and city buses are perfect for small or large group events. Single or overnight trips. Plan you own Tour! Our fleet of school buses serve many local schools and colleges. 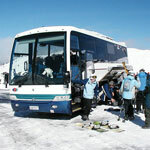 Bayes provide range of popular tours all year round. We are also a premium NZ wide tour operator for tour companies.